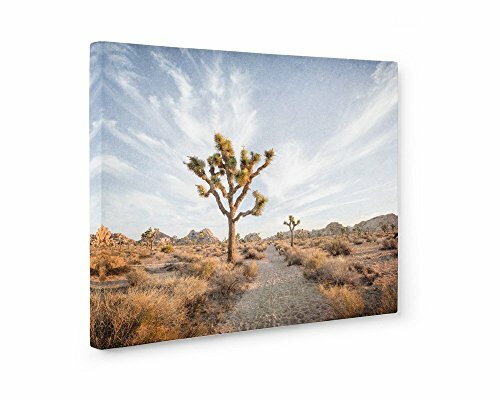 Large Format Print, Canvas or Unframed, Southwest Wall Art, Joshua Tree Photography, California Desert Decor, Palm Springs Landscape Art, Path to Joshua' by Offley Green at HoldUp Art. Hurry! Limited time offer. Offer valid only while supplies last. 'Path to Joshua' comes in two large format options - each with multiple sizes available. THE CANVAS PRINT OPTION The perfect ready-to-hang solution! 'Path to Joshua' comes in two large format options - each with multiple sizes available. The perfect ready-to-hang solution! I work with an excellent canvas print company based here in the USA. They print my work on premium artist-grade poly-cotton blend canvas. Each canvas is 1.25 inches deep and is stretched on a kiln-dried pinewood frame. Images wrap around the edge of this canvas, forming a mirrored edge. The back of the canvas comes with pre-installed hanging hardware. To determine the size of the canvas you need, please take a look at the canvas scale image in the product images of this item. If you already have a frame, or want complete control of display, then my unframed prints are a great option. My photography is printed by my professional lab with a lustre finish on Kodak Endura Paper. Prints have a longevity of 100 years in typical display conditions. If you need help choosing a size, please refer to my size guide for unframed prints in the product images of this item.